God Made it ... Outside! File Folder Game, Checklist & More! I like to say God made this, God made that while we are walking or playing. So, I made this to use while we take walks to have a checklist and we can talk more about God's creation! You can also add more discussion by coloring what you saw outside. She took her job of searching and marking off the items very seriously! I also made the box carriers you see in the above photo to carry the things that God made as they checked them off their list. Directions to put it together is on the download, and I used two 3/8" x 15" ribbons for the handles. You could use string, or whatever size ribbon you have handy. 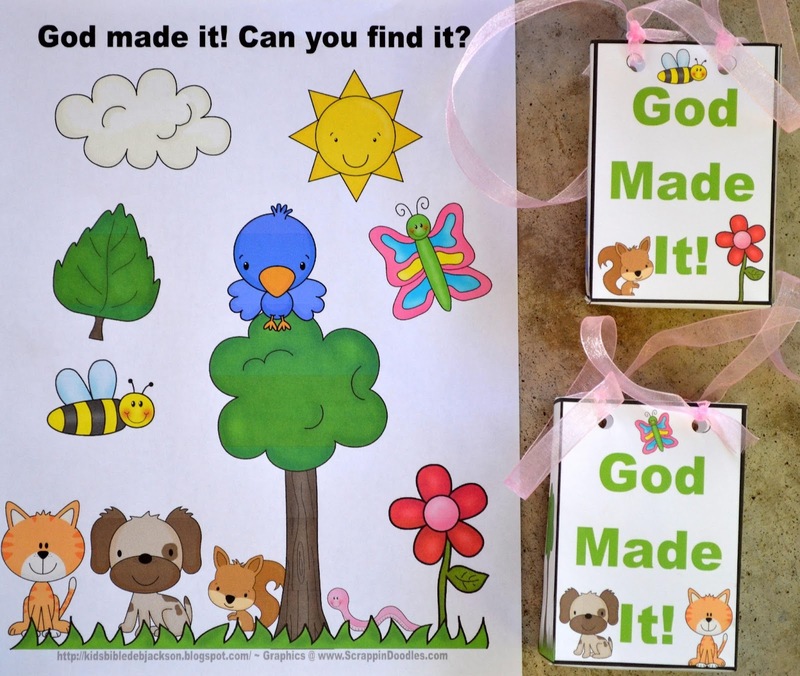 We love file folder games, and this one will work with God's Creation outside. It is a great preview of what to look for outside, or a review of what you found. It is also good to review colors and objects. Click here to print. I also used this as a pre-walk to talk about why we were looking for certain items... things God made. I opened the Bible and read Genesis 1:1. It's a great memory verse! I started this post a long time ago, and these are the early pictures! I love this! Such a great alternative to earth day and a great way to reinforce the endless creativity of God. I'm pinning this. I love it!! Thanks so much Rosilind! I appreciate the super nice comment and really appreciate you pinning it! You always make me wish that I still had young children at home. I'm pinning this too since it is so worth sharing!! Thanks so much for pinning Judith! I really appreciate that! These are even more fun since I get to do them with grandkids! They ask 'Are we doing a project today'? Thank you! Thanks for your awesome comment! I appreciate it! Such a great idea! I will definitely be doing this with my boys. So glad I found your blog through the Tot School Gathering Place! Thanks so much! Glad you stopped by! I appreciate it! Thanks for sharing this fun resource over at the Thoughtful Spot, Debbie! What a great activity!! I love it! We will definitely be doing this one or at least something like it. Thank you for sharing at Sharing Saturday!! Thanks Carrie for stopping by! Thanks for the comment! Love these! I will be using them for my Preschool Sunday School class in a few weeks~I know the kids will have sooooo much FUN! I am so glad you can use these! The girls really had fun! Thanks for stopping by! What a wonderful application lesson for preschoolers. I don't think my 3-year-old class can comprehend that a globe symbolizes the world, so this checklist activity will help them understand that God made everything they can see. A photo of their "hunt" will serve as reinforcement. Thanks! As kids get older, they really enjoy scavenger hunts in the outdoors: things like evidence of an insect having been nearby, find a bird feather, etc. Such good ideas here in your space!